I can’t believe it’s already time for another fashion week! It is fun to see the candid snaps from favorite bloggers. I love your simple chic look here. You have the edgiest style lately Shauna! I hope you join & share those booties at the Shoe & Tell linkup I am co-hosting with Cherie this week! The sunglasses and the black together make the outfit so chic!! Such a GREAT look! I love it, as always!! PS: LOVE the red backdrop too! I love the all black in this outfit! Ive really been leaning towards that lately! Can’t believe it is already NYFW! Can’t wait to see all the pictures from it! Wooo fashion week! Would love to go one day as well! These skirt leggings were huge in Korea the entire time I was there, but you make them look so much more chic! Love this outfit and that top is super cute! Hi Shauna, I love the edginess of your look. Fab t-shirt! Great look! I can’t wait to see the trends of NYFW, either. Any specific designer you are watching? I love this casual yet chic look. Definitely love that jacket! Great look and I love graphic tees! You just got me very excited for NYFW! Such a chic look! Loving the black and gray! What a cute tee shirt, loving how you kept it casual in the styling here! such a fun time! I love the vibrant red in your location for this soot! Def dream of attending one day!! 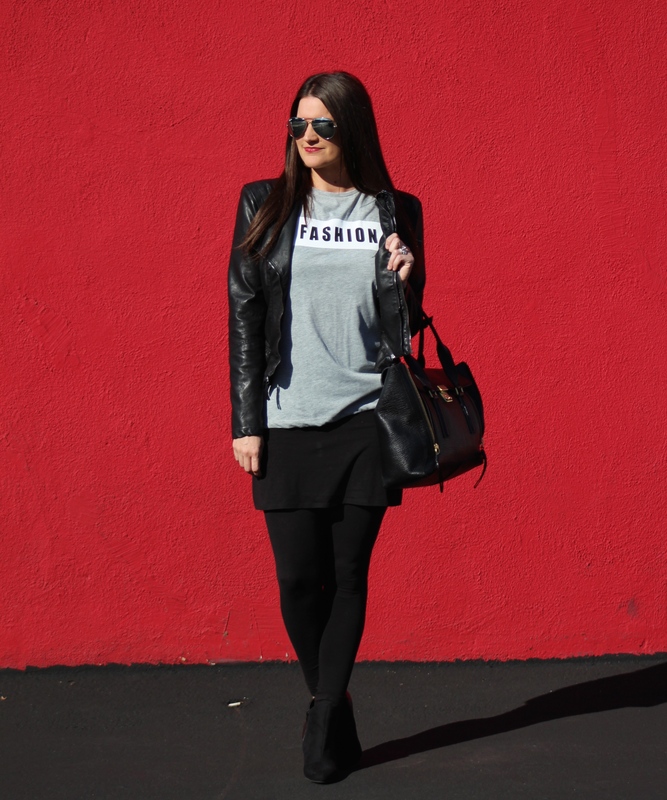 Fingers crossed :)You look great–love how you styled this graphic tee!! Nice seeing a lady with some classy style! Love the t-shirt! But it should better say “Fashion Beauty” – You look gorgeous! Cannot wait for NYFW! Fall is my favorite fashion time of the year, so this is going to be good! You look stunning in this black ensemble! Love the shot with the red wall. Bring on the street style! Is it that time again? Truthfully I love to be in NYC for fall fashion week, but I’d much rather enjoy spring fashion week from the comfort of my living room. Too cold! I agree – would be so fantastic to attend NYC fashion week! Love your outfit! Love that shot against the red wall, makes your outfit really POP! Gurrl, give me that T-Shirt! Lol… Loving the attitude of this look. loving that tee! such a fantastic outfit! Cool look, Shauna! I’m totally in love with your graphic tee and leather jacket combo. And omg, those skirted leggings are cool. I’ve never seen that before! Maybe a rising trend? We’ll see! Have a fab week! Love that “fashion” top!! Too cute! I also can’t wait to see all the trends and stream some of the fashion shows! Loving your black booties, great look with your moto jacket! Thank you for linking up with Shoe and Tell on Style Nudge!! Love your look Shauna! Super chic, cool and edgy! 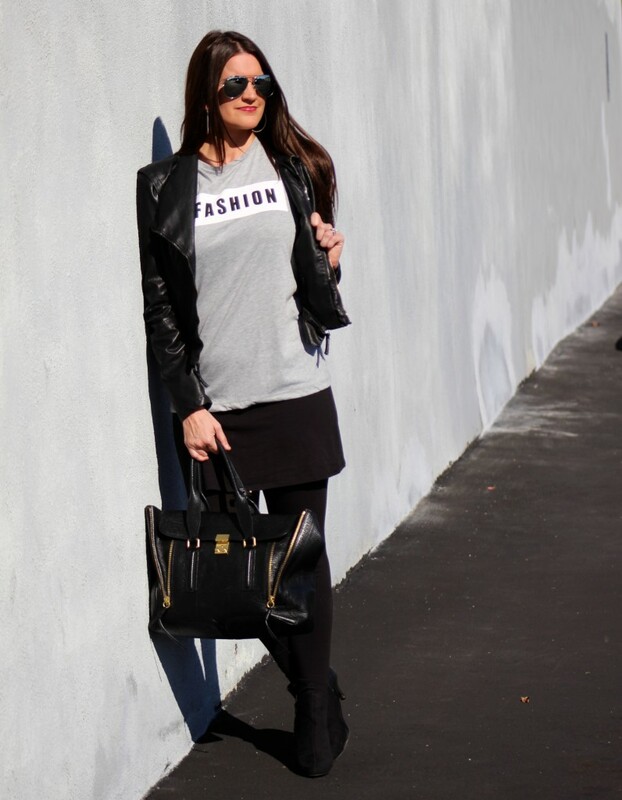 You look amazing in black and the graphic tee is perfect for the look. I love this outfit! The black looks great on you! That tshirt is sooooo COOOL! And stunning bag, babe! I’m loving this outfit and I’m swooning over your Pashli bag! This outfit is too cute! Simple yet chic. Love it! Love the people watching for NY fashion week! This is such a cool chic look that reminds me of it, love that tee! Yes, our city is already bustling. Many restaurants & lounges are already booked out…as to be expected. I’m so ready. Looks like you’ll be here in NYC by way of endless energy & fashion tee. So cute. This post brought a smile to my face. Love this outfit, stylish and comfortable too. This almost total black look is uber cool. I also loved your recent outfit rocking the red wide legged pants. Super stylish dear! Love how you’ve styled this graphic tee! So chic. Your outfit is so awesome! I love that printed tee and it looks perfect with your jacket! I too look forward to some highlights of fashion week! Time out! Skirted leggings?! How is this the first I am hearing about these?! They sound amazing and look adorable!!! My biggest question is: why don’t I won skirted leggings already?? Such a chic look. So chic…love that bag and sunnies! I love the tee and the cool street style vibe! So fun! Gorgeous look! I love the graphic tee! You look so lovely! Swooning PS: Can’t wait for your new post! You look so cute!!! I love the contrast of the red wall behind you, give the picture a editorial type feel.